Lactobacillus acidophilus NAS is a strain developed by Natren Inc in California, USA and is sold only in their products. It has outside research to support it as a probiotic. It has the properties attributed to most L. acidophilus, including that of being a lactic acid bacteria. It also showed excellent bile tolerance in a third-party verification study by Silliker Laboratories. Should You Be Taking Lactobacillus acidophilus NAS? I can help you decide if this probiotic strain is suitable for you to try. If you do try it, I still recommend that you use it as part of a probiotic/beneficial microbes support plan including naturally fermented foods and drinks and probiotic-fortified foods and drinks. 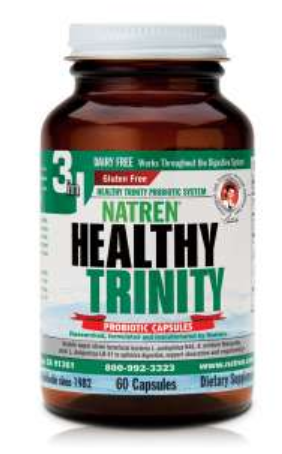 Where Can You Find This Probiotic Strain by Natren? In the US, Lactobacillus acidophilus NAS is found in Natren probiotics. 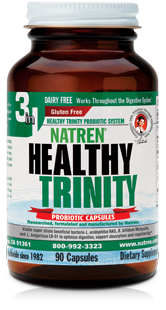 Unlike many manufacturers, Natren only produces probiotics and their manufacturing practices are certified by a third-party international agency. They produce their probiotics in a pharmaceutical-grade facility and do their own culture maintenance, oil-encapsulation and freeze-drying process. Every step of the way is performed under continuous refrigeration to ensure maximum product life. The products are bottled in dark amber-glass with tin lids to prevent moisture and light from harming the products. Healthy Trinity. – Marketed to relieve occasional gas, irregularity and indigestion. Natren GY-Na-Tren – Marketed for supporting vaginal and urinary health. Contains Two bottles of capsules: one is a vaginal homeopathic suppository and one is an oral capsule containing 5 billion CFU of NAS with potato powder, garbanzo bean (chick pea) powder, among others. Natren Mega-Dophilus Dairy-Free capsules – Marketed to optimize digestion, for general wellness, for digestion of dairy products and for small intestine health. Dairy-Free Capsules, minimum 2 billion CFU per capsule. Contains potato powder, garbanzo bean (chick pea) powder, among others. 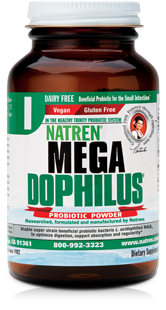 Natren Mega-Dophilus Dairy-Free powder – Marketed to optimize digestion, for general wellness, for digestion of dairy products and for small intestine health. Dairy-Free Powder, minimum 2 billion CFU per half-teaspoon. Contains garbanzo bean (chick pea) powder and cellulose. Go to the Lactobacillus acidophilus page. Go to the Lactobacillus page.